Shaka is Assegai's biggest ever build. David Lockwood took it for a test drive and found a very special, custom charter boat that's even wowing the fish. It's often documented between the pages of this fine journal during field or readers' trips, complete with evocative images of hirsute anglers holding huge toothy fish, but there are those who believe the wider Pacific is the fishing future, deserving of more than just a fleeting visit. Enter Capt Jared Weir. Born in Samoa and part Polynesian, you might expect the skipper to gravitate that way. But it was a very different part of the Pacific, the part that licks the Californian coast, where he got the big-fish bug after joining one of those long-range cattleboat trips. Some years later, Weir moved to Vanuatu where he happily stayed for 13 years and, after getting his skippers' ticket, cut his captaining teeth on the local charter boats. 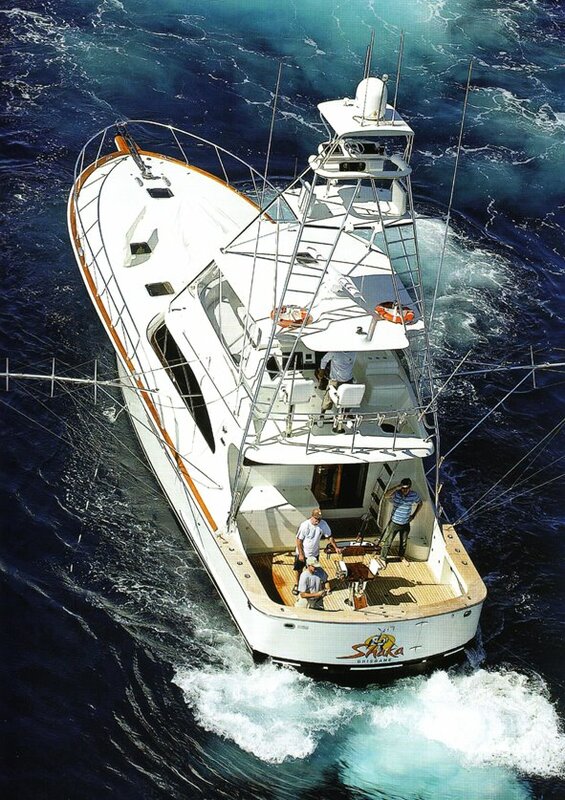 Then, in 1997, he moved to the Australian Gold Coast where he crewed and/or captained, among other boats, Mauna Kea (Pleysier-designed and Barry Martin-built 44), Black Bart (Blackwatch 36) and Adrenalin (Blackwatch 40). 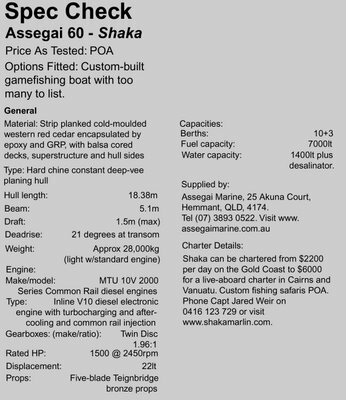 Capt Weir is now the proud skipper of Shaka, the biggest Assegai ever built, a 60-footer sporting twin 2000 Series V10 MTU 1500hp motors. Not only does the luxury long-range boat hit 35kts and cruise at 30kts, the skipper is right now out there in the Pacific islands, helping establish a new live-aboard gamefishery, so you can experience true wilderness fishing aboard the state-of-the-art custom boat Shaka. Of course, boats like this don't just happen along. 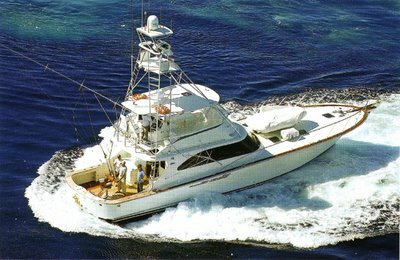 They are very much a collaborative effort between a motivated owner, a fish-savvy skipper and a craftsman with a fine eye, great skill and undying love of boats. 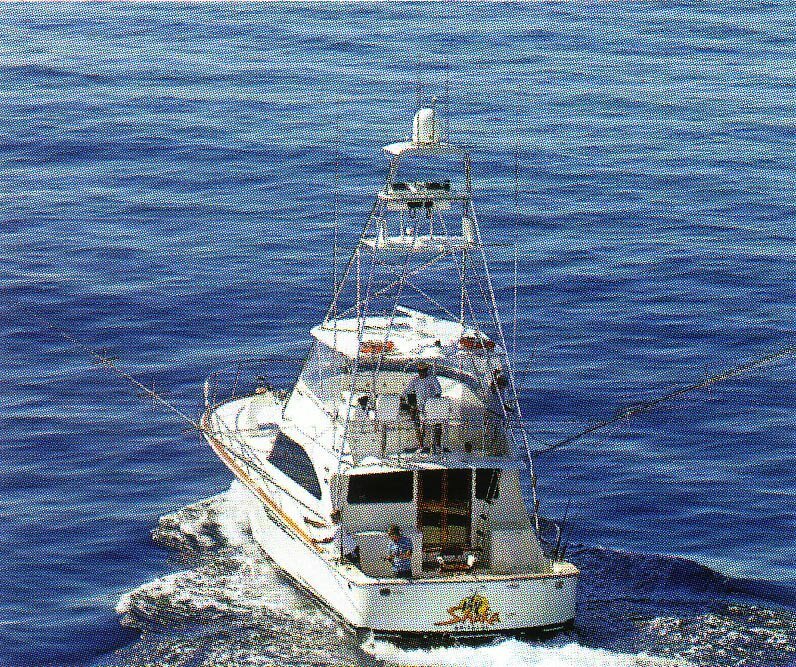 After fishing with Capt Weir, the owner, John Hendry, a retired computer buff, threw the skipper a fateful curve ball. His question went something along the lines of: "If you were going to build the ultimate luxury gamefishing charter boat, what would it be?" It didn't take Capt Weir more than a heartbeat to say it would be an Assegai. After all, the man behind the Assegai boatyard, the revered Barry Martin, built Mauna Kea. 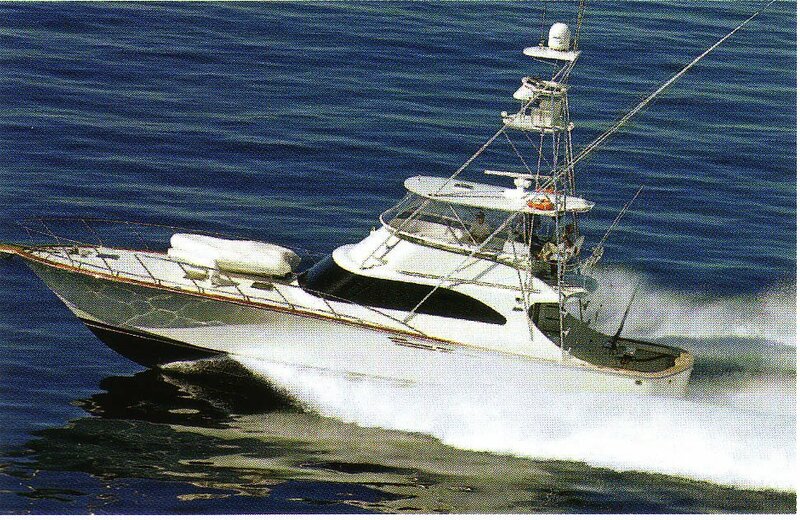 The initial plans were for a 58-footer, but soon the boat had blown out to more than 60ft when Capt Weir had his own quarters built into the floor plan. Shaka was delivered in 20 months. There's a lot of adventures in store for Shaka and all who sail aboard her. 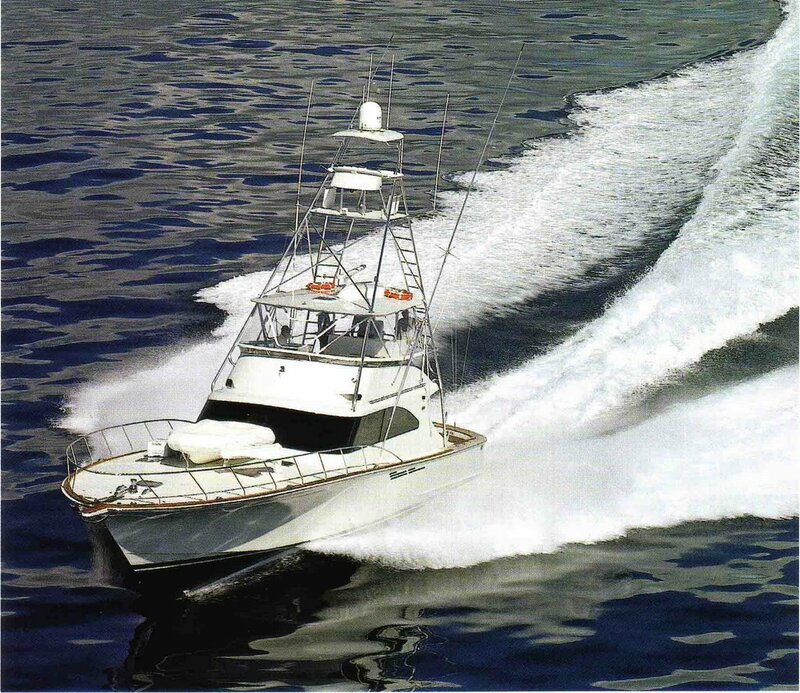 As for the collaborative effort, the boat is the signature work of Barry Martin; the fishing features come from Capt Weir, the top-shelf catering can be attributed to the owner, Hendry, who is out to set new standards and a new level of sophistication in live-aboard gameboats. His menu? Try a salad of bugs, scallop ceviche, truffled lobster risotto and rare roast beef. Even the ice cream is homemade. Barry Martin has gained a lot of wisdom since I was lucky enough to test his first Assegai in 1991. Now, as with then, he is still searching for perfection. That's the mark of a great craftsman. "You can tell a lot from the wake," Martin says, looking back at the unusually clear pattern. "My boats now have tapered or curved chines, reducing in size from amidships to the transom to provide better water flow. Shaka also has openmouthed prop tunnels - a first for Assegai Marine - but absolutely none of the cavitation that has plagued some production boatbuilders' hulls with prop tunnels in the past. "You have to run the tunnels the same width at their entrance as their aft end to encourage the flow of clean water at speed. And they need to be parallel to the centreline. Otherwise the water can't get in." Here I should add that the boatbuilder isn't averse to sharing his wisdom and helping other boatbuilders get their tunnels right. "I've now rounded out the forward sections (or entry) for extra lift, negating the need for planing strakes, but without the boat in any way pounding. As always, Shaka has 21 degrees of deadrise at the transom, like the best of them." Like all Assegai boats, Shaka was built using strip-planked western red cedar with epoxy and GRP. There is a balsa-cored deck and a small 70mm keel that's more for sitting the boat on the dock than anything else. This construction method has proven bullet proof over 15 years of building working boats. Four gigantic laminated girders give lateral support to the hull, while the bulkheads (three of which are watertight including a collision bulkhead) and all the furniture are glassed in for a completely one-piece or monocoque structure. Where better to start than the tower? Like Martin, Paul Selby from Black Marlin Towers is an aesthete with some firm ideas about what looks good and what doesn't. While the tower on Shaka is big, it is possible to wedge yourself in there during a beam-on sea. Capt Weir pushed the envelope with the fitout and electronics, managing to squeeze in two 12-inch Kep multifunction screens, a back-up GPS, autopilot, wheel, and a second set of the Twin Disc Twin Shifts. 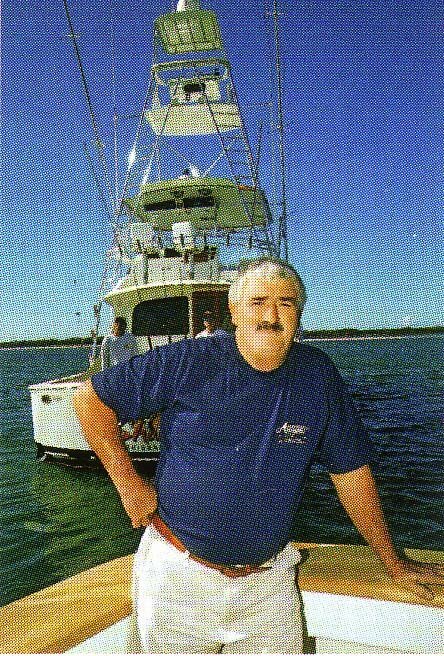 The owner's expertise in all things computers contributed to the boat's cutting-edge computer system. In addition to the two screens in the tower there are three KEP colour, 15inch, waterproof, daylight-viewable, touch-screen computer monitors on the flybridge, each linked to the boat's American Nobeltec charting software, as is the 39-inch flatscreen television in the saloon. The navigation screens have been set-up so you only need to press one button to scroll between sounder/chart/radar. Additionally, there is a 96nm radar with chart overlay and a 3kW sounder with three transducers. 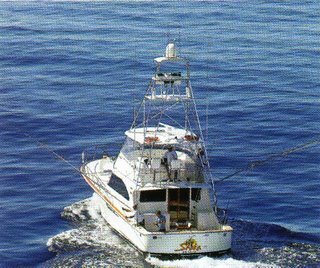 And, as the best skippers will tell you, the Wesmar 360 sonar is amazing for finding bait schools and, moreover, the bait that is being shadowed by marlin. Put the transducer at 12 to 13 degrees and at 8kts you can pick a pod 600ft away with a marlin on it and tell the anglers to get ready to pitch the baits. There is closed-circuit television in the engineroom and the twin MTUs also have their own electronic system monitoring panels (dial-in diagnostics possible). The Twin Disc gearboxes have push-button synchro, cruise and go-slow modes. Meanwhile, the overhead radio box is home to twin Horizon VHF and Icom HF radios, with Fleet 55 Satphone with internet access and a PA system for internal communication. There is also a Bose Lifestyle 48 with remotes and zones in the flybridge, cockpit and house. Connected? Heck yeah. Even mid-Pacific. But amid the high-tech gadgetry, the teak wheel and teak facia harbouring a spread of analogue engine gauges were a welcome traditional touch. On the practical side, Capt Weir specified a cover over the switch and alarm panels so cleaning the dash entails just a spray and wipe. The pneumatic Navigator seats are comfortable for long-range cruising, while there was passenger seating for eight on two lounges forward of the helm. As anticipated, the dinette has proven to be the best table in the boat and it didn't take much to imagine a dinner setting with lingering sunsets in the background. There's a nearby fridge, and, at the push of a button, the table drops on a hydraulic mechanism to become the base for a double bed - the perfect place for the skipper during those less-than-perfect nights at a windblown anchorage somewhere. I'm the first to admit I'm no computer whiz, but I do understand the boat has a powerful DVI-driven computer system with a complete backup computer in case the main one goes down. The computer system includes a video editing facility. Hendry plans to cut the footage from each onboard adventure and burn a DVD for each charterer before they leave. Nice touch. Midstream or fishing adventure he can also send emails with video attachments. Shaka has mostly 24V DC electronic systems while its onboard 240V AC power demands are met by two Onan generators, a 17.5kva primary unit and secondary 9.5kva day gennie, plus geardriven alternators on the big V10 MTUs. The boat also has an invertor and, get this, engine-driven refrigeration units. For survey there is a separate hydraulic-driven bilge pumping system with Martin's own manifold plumbing that other boatbuilders have since borrowed. From left: The engineroom houses MTU 10V Series Common Rail diesel engines; Radios and nav equipment above the flybridge helm, and Miya Epoch electric teaser reels; The stylish and easy maintenance bridge also allows excellent visibility. A couple of last details about the bridge: the clears are the seamless and stiff EZ2C type (unfortunately with gaps around the tower uprights that will allow the ingress of water); there is dedicated rod storage under the lounges for 20 outfits from spin tackle to 501b gear; the triple spreader riggers are from Rupp; and the trick electric teaser reels flush-mounted in the fibreglass hardtop above the skipper are the Miya Epoch type with distance counters and more. Finally, the small observer's seat before the last rung of the ladder has proven to be a neat spot for crew when not working the deck. With the bridge squared away it's time to head to the cockpit. Capt Weir insisted that the ladder was a transverse number and relatively vertical. To his credit, it's a real space saver and a snap to negotiate. Among the standout fishing features are a dedicated rigging centre complete with needles and knife holders and sink for post-surgery clean-ups, a big bait fridge that was designed from the word go for heavy-tackle fishing, and a second fridge/freezer to port that doubles as an outpost for an eager angler. All of this is shaded under a bridge overhang. Shaka has rounded transom corners, which Martin puts in all his Assegai boats, but also a radical radiused transom with exaggerated camber. Its purpose is twofold: one, to ensure the rod tips dear those coamings and, two, to shed water in reverse. Team this with a faultless scupper system that is loath to leak and you have a boot built for going back in a hurry sans tsunamis. Martin says the prop tunnels also help this boat to back up by eliminating cavitation, and the MTUs are responsive providing you give them a second in neutral before banging the throttles back. When water does come aboard, it never finds its way into the lazarette. A small detail, but I noted drain holes in the cockpit corners to prevent annoying puddles. Even backing up, Shaka demonstrates grace with power. Below the cockpit floor are two insulated, lift-out fish boxes, one of which is linked to a continuous shaved icemaker pumping out 600lbs a day - fresh sashimi-grade fish are important on a charter - while the lazarette reveals access to the power steering finger, fuel sight gauge and a remote cooler that can be plonked on deck when in bait-fishing mode. Steps lead from the cockpit to the side decks, which are backed by crew rails, teak toe rails and an alloy bowrail which flexes and needs to be treated more like a lifeline. The non-skid is subtle and unlike a lot of American boats. Shaka's foredeck has functionality too. I noted a Projet 320 and 350kg davit, some terribly funky Dutch flip-up cleats befitting of a spot on a superyacht, and ground tackle including a sparkling stainless steel 65kg Manson anchor, 100m of stainless steel chain with a further 100m of rope tacked on the end. Where most production-built 60-footers go for volume, with deep enginerooms due to high saloon floors and, thus, tall flybridges, Martin's Assegai 60 retains a low centre of gravity. You can see from the cockpit to the for'ard cabin and there isn't a steep staircase to climb down to the accommodation. But while the engineroom, which is framed by watertight bulkheads, hasn't standing room per se, it has something much better. In five to 10 minutes you can pop open the bi-fold saloon floor, whose panels rise on struts, for unfettered access to the motors when servicing and/or carrying out repairs. With the lids open, you have the depth of the engineroom plus the height of the saloon to work with. With the saloon floor down there is still plenty of room for day-to-day engine checks. And, yes, you can easily crane a motor out of the saloon doors should the worst eventuate. The boat's 7000lts of fuel is held in four integral tanks on the centreline where they have the least effect on trim. Water is by way of integral 1400lt tanks and one of those de riqueur desalinators producing 170lt/h. As mentioned, there is a dedicated hydraulic bilge-pumping system and engine-driven fridge units. There was also an oil-change system with reservoir for storing a full load from the motors and gennies. It makes sense to have the fuel-purifying system - dirty fuel is one of the only bugbears for modem diesel motors - and the Racor filters with redundant filters lying in wait. The custom stainless steel sea strainers, two per motor because these MTUs have such high water demands, were veritable works of art and the wet exhausts are a custom system. There were oil tanks for the hydraulic bilge pump and steering, with easily found sight gauges, but thanks to common plumbing lines there are just two skin fittings per side. Last but not least are the internal MTU diagnostic and remote control panels. Hiding under the stairs leading from the saloon to the accommodation is the pump room. I crawled inside and noted the boat's 130lb outfits swinging from the rafters, a speargun, the main battery breakers and gel battery banks, Cruisair air-con units, saltwater deckwash pump, desalinator bits, and an Excalibur water pump. Martin fitted a diesel hot-water service for at-call hot water even when all the showers are running. It negates the need for an accumulator. 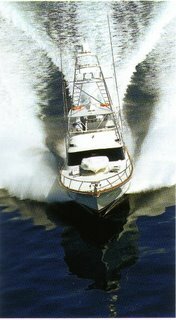 A gurney is there for fast boat cleans, while subfloor there are grey and black water tanks and, as you range further forward, empty chambers for stowing everything from spares to victuals and tools. A clever bi-fold saloon door and electric aft windows bring the outdoors into the saloon and vice versa. The door was offset, at the behest of Capt Weir, to create a bigger living and seating space to port. Unlike any Assegai before it, Shaka has a contemporary rather than ornate finish, with smooth white mouldings and very little timber trim. The minimalist, serviceable, elegant finish is almost shuttle-like. Leather adds to the lux factor and the curved ceiling with outboard lights and concealed air-con vents is the stuff of showboats. From left: Bi-fold doors open the saloon to the deck; View of the galley from the saloon; Neat and tidy, but all the creature comforts are featured in the galley. 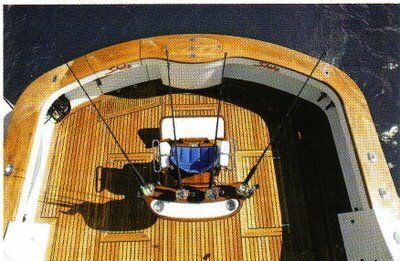 To port, the exaggerated L-shaped leather lounge hides yet more rod storage and has seating for four anglers before the surround picture windows. There is a lounge for two more opposite. Both double as daybeds. The dinette and U-shaped lounge near the galley, before the wall-mounted flatscreen television with home-theatre mode, works well for breakfasts and buffet lunches for up to six. And be prepared to eat plenty of both and some gourmet dinners prepared in what amounts to a custom on-water commercial galley. Stainless steel workspace is a feature of the U-shaped galley, whose return/servery extends further into the saloon than usual. There is practical parquetry flooring and fixed bar stools. Amenities range from two big subcounter fridges to a dishwasher, a Bosch induction cooktop, oven and grill, and a Delonghi coffee machine. There is good ventilation, with a hatch in the flybridge brow and extractor fan and air-con. Still, the health grill and deep fryer are used outdoors. From left: Sleeping quarters feature plenty of storage; Ensuites are well-appointed and functional; Stainless steel appliances feature in the hi-tech galley. Pantry, crockery and storage for provisions is in plentiful supply, while the contents of the computer cupboards across the way were somewhat beyond me. But I could tell by the look in the owner's eye that they meant serious business. Later I caught him checking his emails on the big screen. Nice office. Functionality is the keyword in the four-cabin accommodation plan. Each cabin has a flatscreen television/DVD player. The owners cabin to port appears to have just a lounge before a workstation and a transverse single bed. But tug on the backrests and bed bases and a double bed and bigger single emerges. Thus, you can enjoy the extra floor space in what amounts to an office by day and still get plenty of sleeping space at night. Across the way is Capt Weir's cabin with a single berth upon which he has slept soundly many times before. A shared ensuite, with quiet flush Tecina loo and big shower, tails the foyer between the two cabins. The high-gloss teak vanity top and teak floor were nice touches and a hatch was provided for ventilation. The Miele washer/dryer is concealed in the companionway, not far from the first of two guests' cabins, which feature two generous single bunks. Add the guest's cabin in the bow, with island double bed flanked by single wing berths, plus another head with another mighty shower, and the boat will work well with up to four anglers and four crew on those Pacific Island fishing odysseys. The Pacific Ocean's warm autumn water lapped on the white-sand beaches and white-shoe heels of the Gold Coast. The blue marlin were snapping over the horizon. Great fishing weather, but not so good for boat testing. But Capt Weir was quick to point out that Shaka knows only two speeds: 9kts (hooks in the water) and 30kts (cruise). With Martin's engineering and big running gear, 15-inch shafts raked to a shallow 11 degrees in the half tunnels, and spinning five-blade props, the boat is made for running at sea. At the 30kt cruise and 2100rpm and 80 per cent load, the twin 1500hp 2000 Series V10 MTU motors use 420lt/h. Leaving 10 per cent in reserve, the fuel supply is good for at least 450nm in 15 hours. Top speed has been docked at 38.5kts with full fuel and water, and 37.5kts in present working condition. 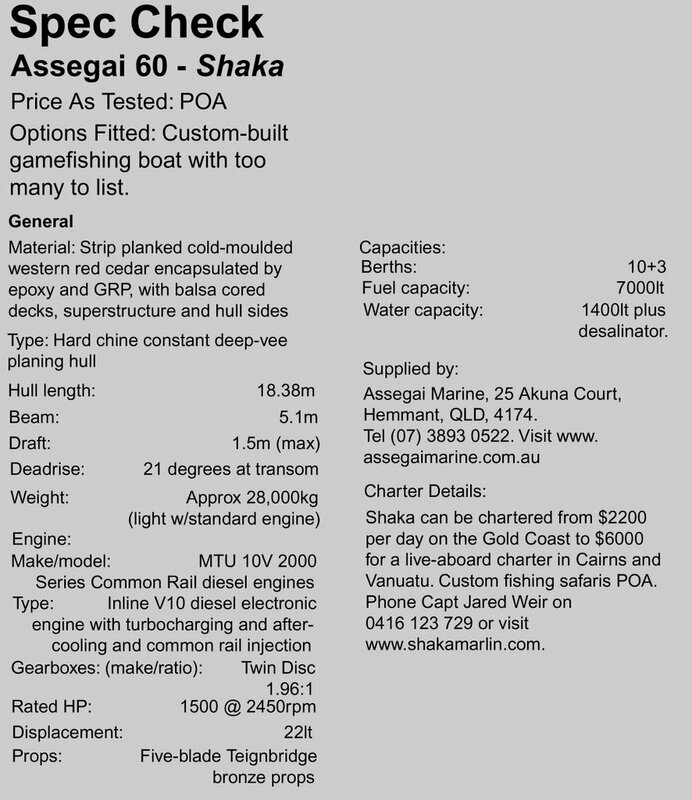 Shaka's captain and owner have already fished Cairns, the Gold Coast, plan to venture as far south as Port Stephens, and at the time of writing they were primed to head to Noumea - a 780nm run from the Gold Coast, of which 72 hours will be spent travelling at 10kts. Then it's on to Vanuatu for 20 days of pre-booked five-star adventure fishing around sea mountains off Espiritu Santo. The longer-term plan is to head to the Solomons, the outer Great Barrier Reef and more. One step at a time, says Capt Weir. Yes, that, and a giant leap forward into the world of sophisticated charter fishing boats.